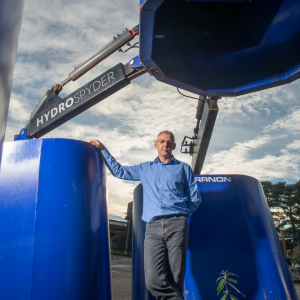 Lateral thinking, combined with ambition, invention – and crucially, funding – have transformed Barrnon Engineering into a global player in the field of environmental clean-up technologies. Today machines designed at the firm’s factory in Appleby are used to assist clean-up operations in countries as far afield as Japan and the USA as well as the UK. Yet these highly complex machines are based on prototypes originally used to dredge scallops off the coast of the UK and France and is just one of a range of devices developed and built by the Barrnon team to cope with hostile and toxic environments. The company was founded in 2007 by managing director Andy Barr, a metals specialist with more than 20 years’ experience in product development. He felt there was an opportunity to develop Barrnon’s dredging technology to work in other fields. Our adviser’s in-depth understanding of engineering technologies was crucial for putting together our case for a £184,000 grant from Innovate UK. The Growth Hub played a key role in securing vital funding, in the form of business adviser Alan Smithson. And their adviser, a chartered engineer and a member of the Institution of Mechanical Engineers, helped Barrnon apply for a grant from Innovate UK, a government initiative to drive productivity and growth by supporting businesses to develop new technologies and ideas. 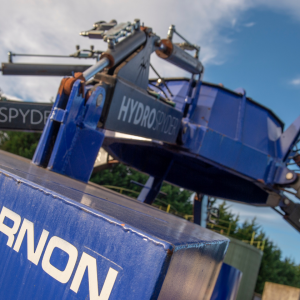 The successful £184000 grant enabled Barrnon to develop their unique Bladecutter horizontal dredge system which has proved so successful that a Mark 2 Bladecutter was commissioned in 2015. Barrnon has since developed a range of innovative environmental clean-up equipment, incorporating emerging technologies such as robotics and virtual reality. It now works alongside engineering giants such as Atkins, Toshiba, TEPCO and IHI Corporation to tackle environmental challenges at sites worldwide including Japan and the US. Over the last 12 months turnover at Barrnon has increased fourfold to £2.8 million, the workforce has increased from 6 to 19, and the company is now developing a suite of specialist environmental clean-up tools. “We are continually looking to develop our products,” Steve says. “Currently we have two prototypes for horizontal and vertical blade cutters with patents lodged in Europe, the US, Russia and China. Barrnon is currently working on projects for the US government, the Innovate Project, and a third which currently remains confidential. In order to prepare for the extra work, the company is planning further expansion by taking on a designer, project manager, finance manager and a QA specialist. There is also the prospect of moving into mining, developing machines capable of working in the oil and gas sectors. “At the moment we are concentrating on doing what we do best, and things are looking extremely positive,” he says. “Looking back at how we got to this position, the funding and support we received through the Growth Hub was invaluable. We went to them with a problem and they provided the expertise to solve it.